If you are a runner you will understand there is nothing worse than an injury. Injuries lead to interruptions to your training, potentially months of rehabilitation and a reduction in performance. Whether you’re a ‘weekend warrior’ or a high-performance athlete, avoiding injury is vital to your ongoing enjoyment and continual improvement with your running. 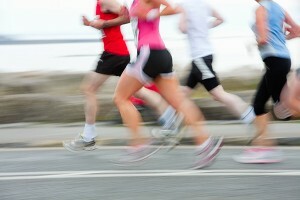 In this article we overview the most common running injuries and strategies to prevent them. Through completing corrective exercises and strength training this can not only improve running endurance and performance but also prevent the onset of injuries as the muscles become strong and resilient. The focus of corrective exercises is to improve your biomechanics, so your body is strong, stable and moving efficiently. The plantar fascia is a think connective tissue which runs under the foot which provides shock absorption, flexibility and forces for propulsion during the push off phase when we are walking and running. When this gets irritated and excess stress is placed under the foot, most commonly from running it is known as plantar fasciitis. This can cause irritating pain most commonly at the heel, in the morning, after prolonged weight bearing and pain in the high arch region. Irritation may be caused from excessive foot pronation, inappropriate footwear or any changes to training routine such as change in surface, or increased load or intensity. Treatment approaches for Plantar Fasciitis can include flexibility exercises to release tight structures, isometric holds (the muscle is in held in a lengthened position) for an analgesic effect (pain relieving) and loading the plantar fascia to strengthen the intrinsic foot muscles. Also correcting foot pronation and strengthening the ankle and surrounding musculature. It is important to reduce the current training load and gradually rebuild running or training volume. Shin splints is one of the most common injuries for runners and can also be known as exercise induced leg pain. The pain most commonly runs down the medial aspect of the tibia for 5cm or more. Pain may vary in intensity and can be worse on palpation but usually is resolved with rest or cessation of exercise. Shin splints may have varying causes however it is most likely due to running mechanics, overtraining, or excessive foot pronation causing prolonged stress on the muscles of the lower limb. Treatment of shin splints may involve massage down the medial aspect of the shin to relieve tightness and applying ice to cool the muscle. As well as stretching the achilles and soleus, reducing training and it is also very important to strengthen the stabilizing muscles such as the glutes and the trunk. Overuse or excessive loading of a tendon such as running, is viewed as the main mechanism of Achilles tendinopathy. This can result in microtears and lead to tendon failure if not rehabilitated appropriately. Previous injuries, poor gait biomechanics, muscle tightness in posterior chain, and unstable surfaces increase risks of excessive loading and degeneration. It is likely to experience symptoms of localized pain at the tendon and pain increases with jumping, running and hopping activities. By exercising this helps align the collagen fibres in the tendon and increases the strength of the tendon and surrounding muscles. A common underlying cause of Achilles tendinopathy is excessive foot pronation and can result in greater forces through the medial aspect of the tendon. It is important to strengthen the muscles of the lower foot and ankle as well improve balance, control foot pronation and internal rotation of the ankle. And finally stretching the tendon to ensure elasticity and range of motion. This can assist with pain, mobility, morning stiffness and running mechanics. As well as the prevention of any other injuries. Spikey ball foot release- for the release of the plantar fascia. Roll the spikey ball under the foot putting as much weight as possible through the foot ensuring toes are relaxed for 60-90secs each side each day. Calf stretch- lift the balls of the foot onto a wall or calf wedge and push forward holding for 30 seconds each side. Calf raises – eccentric and concentric lowers- raising up to the balls of the toes ensuring weight is evenly distributed through the toes hold at the top and slowly lower down. Complete 3 sets of 12 repetitions each day. For an isometric contraction hold at the top for 45 seconds and repeat 5 times. This will act as a pain relief. Arabesque-Point one leg back behind you, take all the weight in the supporting leg with a slight bend in the knee. Tilt forward lifting your leg out behind, squeeze the glutes to bring yourself back up maintaining a level pelvis and long spine. Complete 15 repetitions and 3 sets. Exercise Physiology is concerned with the prevention and treatment of musculoskeletal injury, including common running injuries as outlined in this article. If you are currently suffering an injury through running, contact one of our Accredited Exercise Physiologists for a thorough assessment of your running mechanics.